About 200 to 400 million years after the Big Bang created the universe, the first stars began to appear. Ordinarily stars lying at such a great distance in space and time would be out of reach even for NASA's new James Webb Space Telescope, due for launch in 2020. "Looking for the first stars has long been a goal of astronomy," said Rogier Windhorst, Regents' Professor of astrophysics in ASU's School of Earth and Space Exploration. "They will tell us about the actual properties of the very early universe, things we've only modeled on our computers until now." Windhorst's collaborator, Frank Timmes, professor of astrophysics at the School of Earth and Space Exploration, adds, "We want to answer questions about the early universe such as, were binary stars common or were most stars single? How many heavy chemical elements were produced, cooked up by the very first stars, and how did those first stars actually form? Duho Kim, a School of Earth and Space Exploration graduate student of Windhorst's, worked on modeling star populations and dust in galaxies. The team's paper, published in the Astrophysical Journal Supplement, describes how the challenging observations can be done. The first essential step in the task relies on the infrared sensitivity of the Webb Telescope. While the first stars were large, hot and radiated far-ultraviolet light, they lie so far away that the expansion of the universe has shifted their radiation peak from the ultraviolet to much longer infrared wavelengths. Thus their starlight drops into the Webb Telescope's infrared detectors like a baseball landing in a fielder's mitt. The second essential step is to use the combined gravity of an intervening cluster of galaxies as a lens to focus and magnify the light of the first generation stars. 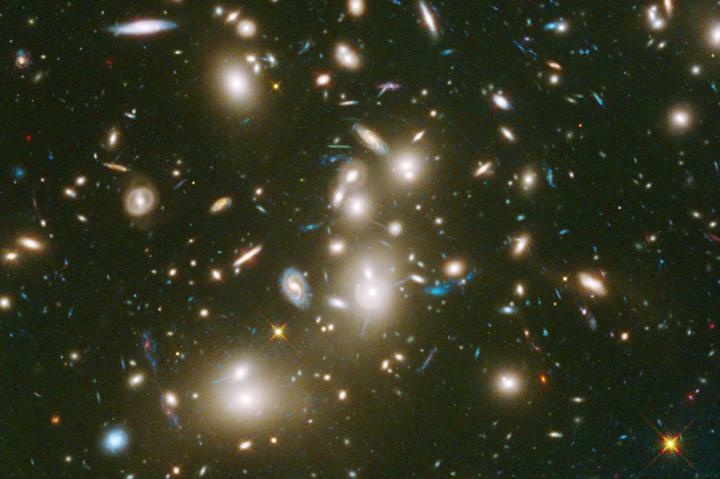 Typical gravitational lensing can magnify light 10 to 20 times, but that's not enough to make a first-generation star visible to the Webb Telescope. For Webb, the candidate star's light needs boosting by factor of 10,000 or more. To gain that much magnification calls for "caustic transits," special alignments where a star's light is greatly magnified for a few weeks as the galaxy cluster drifts across the sky between Earth and the star. Caustic transits occur because a cluster of galaxies acting as a lens doesn't produce a single image like a reading magnifier. The effect is more like looking through a lumpy sheet of glass, with null zones and hot spots. A caustic is where magnification is greatest, and because the galaxies in the lensing cluster spread out within it, they produce multiple magnifying caustics that trace a pattern in space like a spider web. "Depending on which side of the caustic it approaches from, a first star would brighten over hours — or several months," Windhorst explained. "Then after reaching a peak brightness for several weeks, it would fade out again, either slowly or quickly, as it moves away from the caustic line." A key attribute of the first stars is that they formed out of the early universe's mix of hydrogen and helium with no heavier chemical elements such as carbon, oxygen, iron, or gold. Blazingly hot and brilliantly blue-white, the first stars display a textbook simple spectrum like a fingerprint, as calculated by the ASU team using the open software instrument Modules for Experiments in Stellar Astrophysics. It's educated guesswork at this stage, but the team calculates that an observing program which targets several galaxy clusters a couple of times a year for the lifetime of the Webb Telescope could find a lensed first star or black hole accretion disk. The researchers have selected some target clusters, including the Hubble Frontier Fields clusters and the cluster known as "El Gordo." "We just have to get lucky and observe these clusters long enough," Windhorst said. "The astronomical community would need to continue to monitor these clusters during Webb's lifetime." The Webb Space Telescope, however, will be placed at a gravitationally stable point in interplanetary space, 1.5 million kilometers (930,000 miles) from Earth. It has been designed to operate for 5 to 10 years, which might with care stretch to about 15 years. But there's no provision for servicing by astronauts. Upon completion in 2026, the GMT will have a light-collecting surface 24.5 meters (80 feet) in diameter, built from seven individual mirrors. (The Webb Space Telescope's main mirror has 18 sections and a total diameter of 6.5 meters, or 21 feet.) The GMT mirrors are expected to achieve a resolving power 10 times greater than that of the Hubble Space Telescope in the infrared region of the spectrum. "We're planning to make observations of first-generation stars and other objects with the two instruments," Windhorst said. "This will let us cross-calibrate the results from both." "The GMT's operational lifetime will continue for many decades into the future. This is unlike the Webb Telescope, which will eventually run out of thruster fuel to maintain its orbit in space." Said Windhorst, "One way or another, we are confident we can detect the first stars in the universe."